Well, there was a next time. Margaret again walked into my office with the golden mushrooms in tow. "What are you going to do with them now?" She asked. "Put it on your website!" So here we go. By the way, this is my recipe - so if you have suggestions, I'd be happy to hear them. In a heavy pot melt the butter and the olive oil over medium heat. Add the minced garlic and sauté until garlic begins to soften. Add the mushrooms and sauté until the mushrooms have given off their liquid, and the liquid has been reduced. Salt and pepper the mushrooms to your taste, and stir quickly. Deglaze the pan with the vermouth, turn off the heat, and set aside. In a saucepan, melt the butter, and sauté the grated or chopped onion until transparent. Add the flour and cook for a few moments until the flour roux just starts to take on color. Add the milk and stir until the sauce has thickened and has lost the flour taste. Add salt and pepper to taste, and a pinch of nutmeg. Whisk into the beaten egg yolks, a half cup of the white sauce, and then return the egg yolks to the pan, whisking them into the sauce. Add the cheese, stirring to make a smooth sauce. Whip the egg whites, until peaks form, but not too dry. Fold the egg whites into the Cheese Sauce. 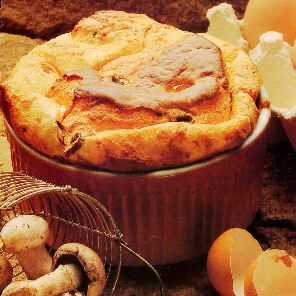 In a previously prepared soufflé dish (buttered and dusted with herbed bread crumbs) place the mushroom mixture in the bottom of the dish, gently spreading the mushrooms so that the entire bottom of the dish is covered. Then spoon the cheese sauce/beaten egg white mixture over the mushrooms. Bake in a 325º oven for 40 - 45 minutes. Serve immediately. Serves 4 to 6. Here, however, is the recipe for the soup. It was originally published in "Those People at That Church" a cookbook written by members and friends of St. Francis Lutheran Church in San Francisco. This recipe is from Marinette Georgi, who grew up in the region around Lyon, France. It's a wonderful, quick, yet festive soup. The recipe calls for regular mushrooms. 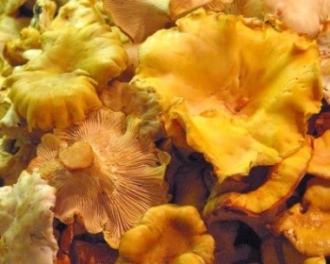 With the bounty that Margaret brought in, I substituted the chanterelles. I also usually omit the bread. In a heavy pot, melt the butter in olive oil over medium heat. Cook the onion and garlic until lightly browned. Discard the garlic pieces. Stir in the mushrooms and cook for 5 minutes. Add the tomato paste and mix the chicken (or veal) stock and stir to combine. Stir in the vermouth, salt and pepper. Bring to a boil, reduce heat, and simmer for 10 to 15 minutes. In a small bowl, beat the egg yolks until smooth. Add the parsley and Parmesan cheese, and stir to combine. Whisk about a cup of hot soup into the egg mixture and then add to the whole pot. Allow the egg mixture to thicken the soup, and then be prepared to serve. To serve, place a slice of bread in each soup bowl. Pour soup over bread and serve at once.